Thanks to our friends at BWW Geeks World for this article and the great tips! When it comes to today’s high tech cars and trucks, most drivers understand that following a scheduled maintenance program almost always costs less than paying for expensive repair surprises down the road. But which mistakes, bad decisions and missed maintenance items do the most damage to your vehicles? CarMD.com Corporation surveyed its team of Automotive Service Excellence (ASE)-certified Master Technicians, which has more than 840 years of combined experience repairing cars, to reveal the following top 10 maintenance mistakes car owners make when caring (or not caring) for their vehicles. “When consumers fail to properly maintain their vehicles, the resulting repair costs dwarf the money that could have been budgeted to maintain their car” —Art Jacobsen, vice president, CarMD.com Corporation. No. 3 in the top 10, “not changing your oil” was also listed by technicians as by far the single most damaging car maintenance item that their customers neglect that they wish they could change. Dirty oil ruins today’s high-tech engines. Camshaft actuators can freeze when restricted by dirty oil, and a faulty camshaft actuator can in turn cause the “check engine” light to illuminate, resulting in complete engine failure if ignored for too long. 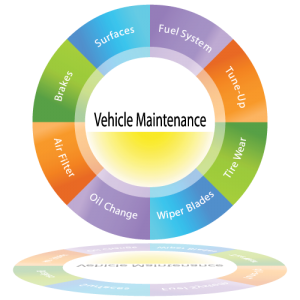 Simply following the factory-recommended oil change schedule helps vehicle owners avoid this problem, along with potentially hundreds, if not thousands of dollars in extra repair costs. Ignoring the “check engine” light is another example of how putting off repairs on a small problem can escalate to an expensive repair. According to the CarMD Vehicle Health Index, the most common reason for a “check engine” light is a faulty oxygen (O2) sensor. A dirty air filter (<$20 repair) can result in an O2 sensor failure (<$250 repair), which can in turn result in substantial gas mileage reduction, cause the vehicle to misfire and eventually result in the need for an expensive catalytic converter replacement (>$1,000 repair). That’s why it’s so important to have your car’s air filter replaced as recommended by your service manual, and to address “check engine” warnings as soon as possible. Please be sure to follow your factory-recommended maintenance schedule to ensure the health of your vehicle! Posted on August 26, 2013, in Automotive, Maintenance Monday and tagged Car Maintenance, Crystal Koons, Koons, Koons Chevy, Koons Chrysler, Koons Ford, Koons Kia, Koons Nissan, Koons Toyota, Krystal Koons, maintenance, Maintenance Monday, Vehicle Maintenance. Bookmark the permalink. Leave a comment.